space, a variety of entertainment and dining venues and much more! Located at the center of the Strip and adjacent to The LINQ and High Roller, this Las Vegas hotel combines heart-pounding excitement with hospitality and service that’s second to none. 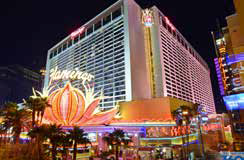 The Strip’s most historic hotel underwent a $90 million renovation of 1,270 rooms last year!